Janesville Debate: Dissecting Ryan's Claim, Obama's 'Promise' & The Facts : It's All Politics There are claims flying back and forth today over whether Republican vice presidential nominee Paul Ryan has falsely accused President Obama of breaking a promise to make sure a GM plant in Ryan's hometown stayed open. Let's look at the facts. 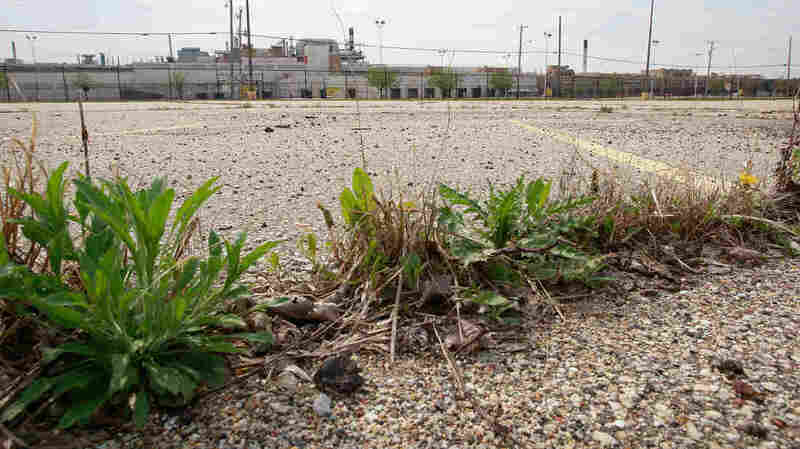 Weeds were already growing in the parking lot outside the GM assembly plant in Janesville, Wis., on May 4, 2009. There are claims flying back and forth today over whether Republican vice presidential nominee Paul Ryan has falsely accused President Obama of breaking a promise to make sure a GM plant in Ryan's hometown stayed open. We posted earlier about Ryan's words in his acceptance speech Wednesday and the "false" rating they got from PolitiFact.com. This morning, conservative pundits such as former Bush White House spokesman Ari Fleischer are sticking up for their candidate: "Ryan was right about Janesville GM plant. 'Factchecker' Politifact wrong. Check out the Milwaukee Journal http://po.st/hoyioW" Fleischer has tweeted. PolitiFact editor Bill Adair, though, isn't adjusting the "false" rating. "So far I've seen nothing that would make us want to," he told us this morning. We thought we would walk through what was said and what is known. "President Barack Obama came to office during an economic crisis, as he has reminded us a time or two. Those were very tough days, and any fair measure of his record has to take that into account. My home state voted for President Obama. When he talked about change, many people liked the sound of it, especially in Janesville, [Wis.], where we were about to lose a major factory. "A lot of guys I went to high school with worked at that GM plant. Right there at that plant, candidate Obama said: 'I believe that if our government is there to support you ... this plant will be here for another hundred years.' That's what he said in 2008. "Well, as it turned out, that plant didn't last another year. It is locked up and empty to this day. And that's how it is in so many towns today, where the recovery that was promised is nowhere in sight." Ryan's critics say that's effectively accusing the president of saying he would make sure the plant didn't shut down. Note, though, that Ryan says, "we were about to lose a major factory." He acknowledged that the plan to shutter it had already been announced. But Adair tells us — and PolitiFact's post makes clear — that Ryan got the "false" rating not only because of what he said Wednesday night but for what he said at a campaign rally on Aug. 16: "I remember President Obama visiting it when he was first running, saying he'll keep that plant open. One more broken promise." "I know that General Motors received some bad news yesterday, and I know how hard your Governor has fought to keep jobs in this plant. But I also know how much progress you've made — how many hybrids and fuel-efficient vehicles you're churning out. And I believe that if our government is there to support you, and give you the assistance you need to re-tool and make this transition, that this plant will be here for another hundred years. The question is not whether a clean energy economy is in our future, it's where it will thrive. I want it to thrive right here in the United States of America; right here in Wisconsin; and that's the future I'll fight for as your president." Note that he didn't make a clear promise that the plant wouldn't be closed if he was president, but that he would "fight" for such a future. Certainly, though, the message to people in Janesville was that he would work to save their jobs. NPR's Scott Horsley reported on Obama's Janesville address that day. The Associated Press reported on April 19, 2009, that "GM spokesman Christopher Lee confirmed operations at the southern Wisconsin plant will cease Thursday. About 1,200 employees were let go just before Christmas when GM ended SUV production at the plant. Some 100 workers were retained to finish an order of small- to medium-duty trucks for Isuzu Motors. Lee said most of those workers will be laid off Thursday. He said others will be kept on to help with the plant's shutdown." The Christmas referred to would have been in December 2008 — one month before Obama was sworn into office. The figures mean that about 93 percent of the workers had been laid off before 2009. The local Gazette wrote on April 21, 2009 — three months after Obama entered the Oval Office — that "GM spokesman Chris Lee said another 40 to 50 employees in skilled trade" would "work to decommission the plant." The same day, in another story, it said "GM ended local production of full-size sport utility vehicles in December . Work on the plant's medium-duty Isuzu line is scheduled to end Thursday. As a closed plant, Janesville is in a precarious position." The newspaper's coverage of the plant closing is collected here. But that likely won't satisfy Ryan's supporters. On Aug. 6, 2010, the local Gazette wrote that "no operations are under way in Janesville. GM ended light-duty production here in December 2008 and shut down a small medium-duty operation the following April." On Oct. 23, 2009, the newspaper wrote that of the 1,200 workers who had been at the Janesville plant, about 575 had yet to be finally erased from the idle factory's workforce "through buyouts, retirements and transfers to other plants." They were being encouraged to apply for "voluntary transfers" to other GM plants. If they didn't, they could be put in for a "forced transfer." Refusing that could lead to termination, the newspaper wrote. "It's President Obama who needs to explain his words," Ryan spokesman Brendan Buck says in an email he just sent us. "The facts are clear: when the GM plant went on standby the president told the people of Wisconsin he would 'lead an effort to retool' it and restart production. But when the bailout's winners and losers were decided, Janesville ended up losing. The people of Wisconsin, like so many Americans, are still waiting for the president's imaginary recovery." "Reports that the GM plant I visited in Janesville may shut down sooner than expected are a painful reminder of the tough economic times facing working families across this country," Obama said in a statement released by his Wisconsin campaign organization. "This news is also a reminder that Washington needs to finally live up to its promise to help our automakers compete in our global economy. As president, I will lead an effort to retool plants like the GM facility in Janesville so we can build the fuel-efficient cars of tomorrow and create good-paying jobs in Wisconsin and all across America." Buck adds that the campaign is talking with PolitiFact about adding some of that background to its post.